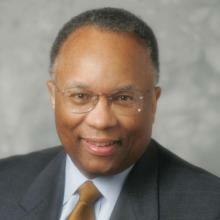 Larry Thompson retired from PepsiCo, Inc. in December 2014 as Executive Vice President – Government Affairs, General Counsel, and Corporate Secretary. He was responsible for PepsiCo's worldwide legal function, as well as its global government affairs and public policy group and its global citizenship and sustainability team. Mr. Thompson’s government career includes serving in the U.S. Department of Justice as Deputy Attorney General and as U.S. Attorney for the Northern District of Georgia. In 2002, Attorney General John Ashcroft named him to lead the National Security Coordination Council. Also in 2002, President Bush named him to head the Corporate Fraud Task Force. Previously, Mr. Thompson was a partner in the Atlanta, Georgia law firm of King & Spalding. Mr. Thompson holds a B.A. from Culver-Stockton College, an M.A. from Michigan State University, and a law degree from the University of Michigan.